This painting, a gift to Lincoln Library’s Sangamon Valley Collection from Dr. James Donelan, depicts a red-coated trumpeter whose music disturbs hotel patrons, makes women and police officers faint, and upsets children, dogs and goats. The Jefferson House (“Good accommodations, and terms reasonable”) was at 700-02 E. Washington St.; the site now is part of the Prairie Capital Convention Center’s parking garage. 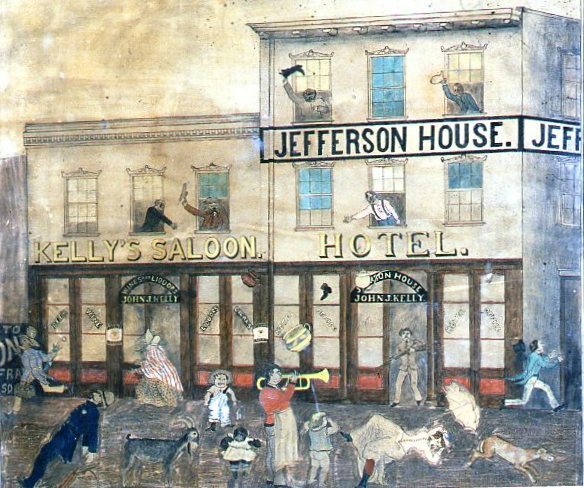 The raucous entertainment pictured … took place in front of the old Jefferson House at 7th and Washington Sts. Titled “The Power of Music,” the scene was painted in 1885 by John Mahony. Mahony was a laborer for the Wabash railroad, occasional artist, and a regular patron of the Jefferson House. This saloon/hotel operated from the early 1800s until about 1910. None of the persons are identifiable, but some were undoubtedly known to Mahony. F. Reisch’s Lager Beer is advertised on a poster near the door. Rumor had it that the second floor of the building was a popular meeting place for city aldermen. This entry was posted in Amusements, Arts and letters. Bookmark the permalink.